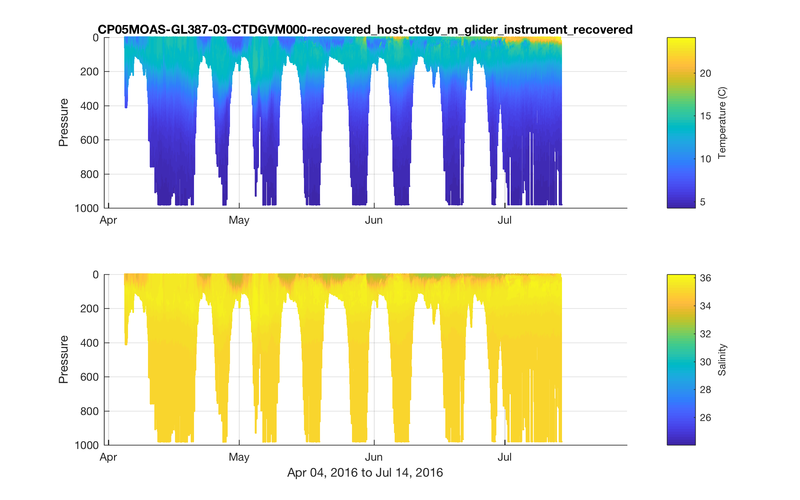 In this tutorial, we will make some quick transect plots of Glider CTD data (which are also sometimes called section plots or profile timeseries). We’re going to use the same data file as the NetCDF Tutorial, so if you want to follow along, take a look at that tutorial for more information on how to obtain and open the file. First, let’s specify a variable which points to the file we have already downloaded so we don’t have to type it out every time. Then we’ll load in the data that we want to use. Now that we have the data, we can make some pretty plots. Figure 1. 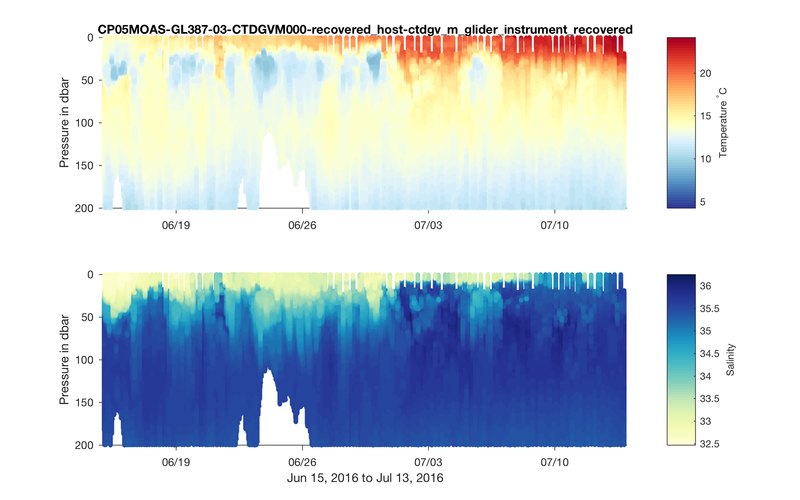 Transect plots of temperature and salinity from Pioneer Glider 387, deployed in 2016. For these plots, I used scatter3() which plots every point as an individual dot. An alternative approach is to use the combination of meshgrid(), griddata(), and pcolor(), but because griddata() interpolates across all data points available, we would have inadvertently filled in the lower depths with erroneous data values when the glider wasn’t in deep water. scatter3() avoids this by just plotting the data we have. However, because scatter3() is designed for plotting 3D datasets, we actually need to pass through an array of 0’s for the 3rd dimension, so we use 0*dtime. Adding view([0 -90]) shows only the 2 dimensions we want (in this case, depth and time), and the -90 automatically flips the y-axis for us so deeper waters are on the bottom. Note, if you are plotting a smaller (or larger) time range, you can play with the marker size (the value 12 is used above) to see what works best for you. Finally, a note on the labels. I’m using the “source” metadata attribute as the title. Because it includes a lot of underscores, I set interpreter=none, so Matlab won’t automatically uses those underscores to convert letters to subscripts. I also like to use xlabel() to output the full date range of the dataset shown, because it might not be obvious from the axis tick marks. While the above example grabs data for the full range of time in the dataset, if we only want a subset of the full dataset, we can add additional parameters to the ncread() function to identify the specific data we want to extract. Specifically, we need to add start, count, and stride as input parameters. In order to figure out which data to extract, we will first pull the entire time range, and then use that to figure out the specific indices we want. In this case, we’ll set stride equal to 1, so we get all of the data. We also need to figure out the count parameter. In this example, we could use length(ind), but a better choice is ind(1)-ind(end)+1, will work even if we change the stride value to some other step. Now, we can make a new plot. Figure 2. Transect plots of temperature and salinity, showing a 1 month subset of data that was depicted in Figure 1. Now we have some cool (or rather cold and warm) glider data, but the colors are not ideal. If we were creating this figure in Python, we could use the suggestions provided by cmocean, but another good choice are the colormaps provided by ColorBrewer. An easy way to add ColorBrewer colormaps to your scripts is to download BrewerMap from Matlab’s File Exchange. While we’re at it, will make a few other adjustments to the plots to clean them up, and we’ll also zoom into the top 200m which is where most of the action is. Figure 3. The same as figure 2, but with improved colormaps and only showing the top 200m. 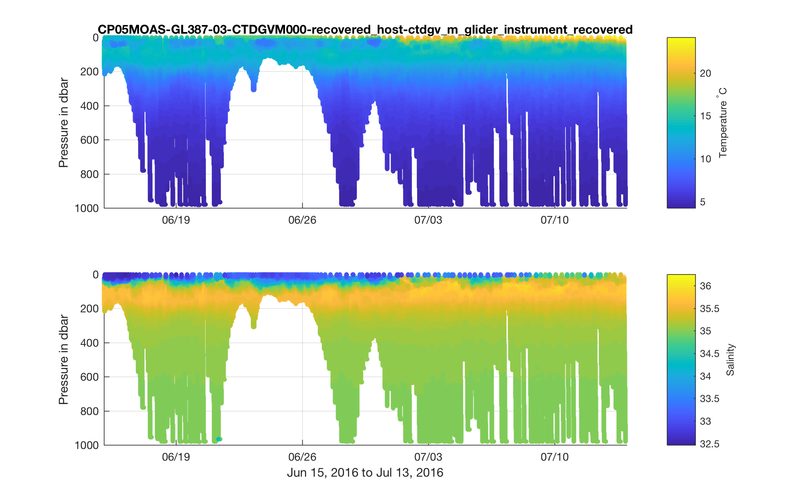 Now that we have our cool Glider plot, we can start looking into the oceanographic features and events it shows.